The first couple years after we opened in 2004, we would get numerous people coming in asking, “Can you surf on the lakes?” or flat out doubting us: “You can’t surf on the lakes.” All while Lake Michigan would be erupting with stormy surf just down the street. After FOURTEEN YEARS, the questioning has subsided and more and more people take lessons each season, buy or rent boards and hit the water. Kids of all ages come into the shop each summer looking for proof of lake surfers and to surf Lake Michigan. We throw them to our surfing instructor and wahine, Ella Skrocki, and they exit the water stoked and ready for more salt-free rides. Students leave feeling a sense of accomplishment, confidence and with smiles on their faces. When inlanders hear about surfing, they think Hawaii and California. Many brag about learning on the North Shore, but who can brag about catching their first wave in a lake?! Of course surfing Lake Michigan is different from surfing in the ocean, but is just as satisfying and as fun. Between the mix of awesome waves, beautiful scenery and minimal crowds… makes for a perfect day. 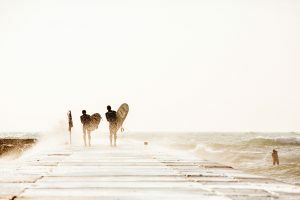 Many would agree that Lake Michigan surfing is an exciting and unique experience. It’s more special to surf in the lake because it’s not as frequent. It’s an incredible feeling to wake up and hear the wind blowing through the trees and howling outside your door because you know the waves are begging you to come play. Lake Michigan’s shoreline is 1,659 miles long and is lined with beautiful point, pier and sand-bar surf. Around here, surfable lake waves can be found to the north, south or anywhere in between, dependent on the wind direction. We have many trusty local surf spots and favorites. On a day with south-southwest winds, you’ll find surfers of all styles in the water at the Frankfort break wall. You could find surfers in Empire on a west wind and at Leland on a north. The energy in the water is fun and welcoming here on Lake Michigan. We strongly suggest that before you get in the water for the first time, to take a surfing lesson. Surf lessons will help you progress much faster and teach you important safety guidelines. Plus, our surfing lessons are just plain fun! Check out our surf lesson page for more info. Ella was interviewed by Michigan Public Radio about Great Lakes surfing… Check out the interview here. If you’re interested in learning more about surfing the Great Lakes contact us at 231.326.9283 (WAVE) or visit our Weather & Waves page. Or if you’re in need of some SBSK gear, be sure to visit our Shop page for boards, shirts, Neoprene and more!